Suriya who is awaiting his next release Si3 was on a whirlwind tour of a few towns in Tamil Nadu in connection with the promotion of his film Singam 3 aka Si3. 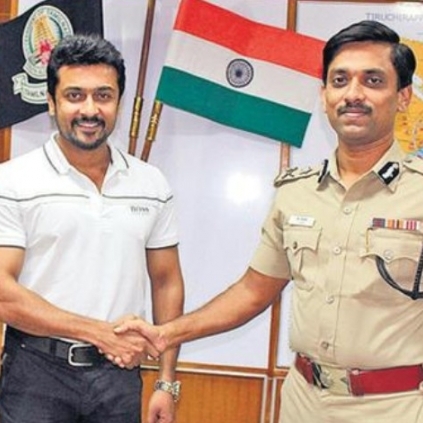 When he was in Trichy, he had apparently met the commissioner of police Mr. Arun and had congratulated him on the peaceful way in which Trichy police had conducted jallikattu recently. Reports state that Arun and Suriya are good friends and that Arun was the role model for Suriya whenever he did cop roles in films such as Kaakka Kaakka and others. People looking for online information on Arun, Jallikattu, Suriya, Trichy police commissioner will find this news story useful.